Our lawyers have a 100% acceptance rate for visa applications with Ecuador’s Office of Immigration. Ulloa & Zamora's attorneys work closely with the immigration offices in Cuenca (Azogues), Quito, Guayaquil and Manta to make sure all of our clients visa applications are processed correctly and in the shortest amount of time possible. From finding an apartment in Cuenca or other parts of Ecuador to shipping containers, we have the connections you need to make Ecuador your new home. Our attorneys keep abreast of the rapidly changing import laws to make sure all of our clients are able to take possession of their goods in a timely and efficient manner. Our lawyers offer complete translations and notarizations for any kind of document, including visas, real estate and medical. With expert translators in Cuenca, Quito, Guayaquil and Manta, we can meet all of your translation needs. Need help setting up a Cuenca bank account or getting health insurance? Our lawyers provide hourly personal assistance services. We have lawyers, paralegals and messenger groups in Cuenca, Quito, Guayaquil and Manta on call 24 hours a day to meet all of your needs. every case involves unique challenges and opportunities – and Ulloa & Zamora's attorneys spend whatever time is necessary to answer your questions or concerns and learn about your needs. 2We know the laws that serve our clients. Our attorneys are familiar with Ecuadorian law, United States law, and international agreements. Our acceptance rate for visa applications with the Office of Immigration in Ecuador is 100% — immigration officials call us when they need help interpreting the law. 3We are committed to providing clients with fair costs for legal expenses. General office appointments cost only $30, and our fees for immigration, visa and relocation services are often half of what our competitors charge. The Lawfirm of Ulloa & Zamora started with one attorney in Cuenca, Ecuador who handled employment law; now we have three attorneys who work full-time on immigration issues, business law, and civil and criminal cases. Our staff is recognized for services in translation and relocation and for personal assistance with other needs, such as setting up bank or internet accounts. We speak English and Spanish in our office. Our main office is still in Cuenca, and we have two offices in the United States – one in Colorado and one in New York. We work with clients from all over Ecuador, North America, Asia, and the Middle East. As we have grown, we have focused on attracting exceptional attorneys, staff members, and business partners who enhance and expand our firm. 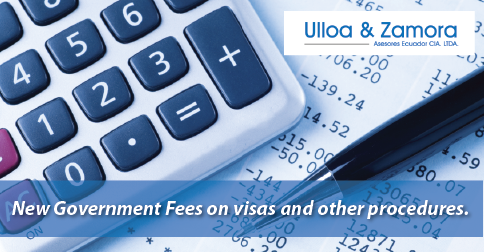 New Government Fees on visas and other procedures. You can now apply for dependent visa – under marriage -again! We believe in learning about our clients and what matters to them. This leads to better results and less stress in the legal process. See what our clients say below. We are committed to knowing as much as possible about Ecuadorian law, United States law and international agreements. This allows us to approach cases proactively, creatively and confidently. We provide quality, personalized legal services at a fair price and are proud to work with people from all walks of life. Your interests will be represented accurately and openly. I want to recommend the law firm of Ulloa & Zamora. I worked with Lina and her team to get my Professional visa, and so appreciated their professionalism, patience, and persistence. There were various changes to the visa requirements that occurred during the process, and Lina navigated them calmly and professionally. They helped to simplify the process for me, and I can confidently recommend them. It's really hard to prepare the necessary documents for the visa especially that the law kept on changing in just overnight. I was so worried because I am running out of time. Been with the 3 different facilitators, lawyer and agency till I finally found Dra. Lina, recommended by a friend. And after reading a lot of good things about her, I immediately called her. Many expensive documents that I prepared which is not necessary. But with her, all the documents that she asked me to prepare were all good. And I finally got my visa and cedula! Highly recommended, fee is affordable and it includes the application of permanent visa after 2 years. Wonderful, right? And with her, you can't just get a lawyer that will help you with your visa, she is also a friend... a very good friend. Dra. Lina - "The lawyer with a heart" They offer different kinds of services, you can count on them. Dra. Lina Ulloa and and Dr. Jose Zamora And not only her, her staff are not only beautiful but very kind and approachable, especially Ms. Jessica who assisted me, whose support is always there. I am glad to convey my regards to Abogada Lina Ulloa and her staff. Her timely approach helped me for my visa processing. I highly recommend her service because she helps to do everything without any delay. She is highly approachable. With her help, I could extend my visa. She is a famous attorney and helps others without any hesitation. Good luck to Lina Ulloa and her staff. I want to recommend Lina and her team, Isabel and Sofie. I just finished my visa and cedula process with them. They were very helpful and patiently responded to all my questions involving the process. All the translations of my papers for the process were done by Sofie, which saved me a lot of trouble. Either one of them joined me to any official appointment I had to go. The service was great and the cost of the service reasonable. If you are not secure in your Spanish yet, I can only recommend using their service for your visa application process. Hello Fellow Immigrants and Dreamers, It can be very stressful and intimidating dealing with the logistics of making a move to a new country. There are so many things to keep track of, and many surprises that can put up roadblocks to a successful residency in Ecuador. A friend referred Lina Ulloa to my wife and me for taking the stress out of such a relocation. It is not usually a smooth process. Lina and her associates were there for every step. We arrived knowing very little about the constantly changing immigration laws. We would have been lost without Lina’s help. We always knew where we stood in the process because of Lina’s outstanding communication. Now that we are getting our cedulas, we are so thankful to have Lina Ulloa as an advocate. She goes above and beyond to help in every way possible. We would recommend her without hesitation. I relocated here in September, 2015, for work. I’ve since received my residency and my cédula. Thank you so much to the efficient work and assistance by attorneys, Lina Ulloa and Jose Zamora. They assisted with every aspect and every detail needed to have all of my papers in order, correct and legal. They also work very closely with an attorney in the States when needed to make sure all papers are in order. Lina and Jose were and are the most trusted attorneys I have ever dealt with including in the States. My wife and I will continue to request their services moving forward. Thank you Lina and Jose for your hard work and dedication. My wife and I relocated to Cuenca in November, 2015, and were recommended to Lina. What Lina accomplished amazed me. In 34 days we had our visa and by the time 45 days rolled around we had our cedula. We came to her office equipped with the needed documents and gave them to Lina. We opted to get individual 9-1 visas as to avoid future problems when one of us dies. Her going rate is $750, which covered everything except fees charged by the government, to obtain the visa and cedula. She drove us to the new immigration office once to file the application and again to pick up our visas. Between computer system crashes and the crowd of people she spent about six hours at the immigration office with us. I'm sure it would have taken longer but with 15 years’ experience she has gotten to know the right people and the order in which they like the documents presented. This was one stop shopping at its best. Translation, applications, transportation and more. Lina’s calm presence and good counsel proved invaluable during litigation of the termination of our residential rental agreement in Cuenca, Ecuador. She explained court procedures, ensured our rights were adequately protected, and acted as a buffer from the landlord’s incessant demands. Lina also proved herself a true friend and advocate when my husband suffered a life-threatening medical event. She helped to arrange his discharge from the hospital, set up nursing care, and provided solid financial advice. Her office even put the word out to the local expat community that we were in trouble, which resulted in a flood of assistance! The Lawfirm of Ulloa & Zamora has access to several real estate properties, both for sale or for rent, and we are familiar with the local property market and the average prices. There is no multiple-listing service for real estate (MLS) in Ecuador, which means you have to rely on word-of-mouth, foot traffic, and advertisements to locate a home. We have an extensive network of Ecuadorians and foreigners who keep us posted on properties. Our experience in handling customs and imports, plus our background in real estate transactions, means you have a better opportunity to settle into your new home more quickly and with less stress on the journey. So contact us to answer all your real estate questions! © 2019 Ulloa Y Zamora.